As a fan of the late, great Texas wildlife artist John Cowan - Jack as some knew him prior to his death in 2008 – I’ve grown to admire many of the man’s sporting art prints over the years. My favorite might be one the more famous prints that Cowan ever did - for a Texan, at least - the 1990 work known as Coming to Horns. That gorgeous print depicts a cactus-filled South Texas deer hunting scene deep in the fabled Brush Country right at the height of the December rut. There's the late Bill Carter - a longtime Texas deer hunter and owner of Carter’s Country outdoors stores in the Houston area, who passed away in the fall of 2018 - wearing his trademark cowboy hat, dutifully working a magnum set of rattling antlers, or horns as the state's hunters affectionately call them. Then there's the hunter in the Cowan print, the late Ray Sasser - the longtime outdoor writer for the Dallas Morning News who passed away earlier in 2018 after a long bout with cancer - who is immortalized as he slowly raises up a bolt action rifle and looks for a clean shot. And then there's a dark antlered Muy Grande buck, a burly giant working his way through the thorn-choked brush complete with a set of Boone and Crockett sized headgear. A bit nervous, a bit angry – the testosterone fueled whitetail is searching for the source of a backwoods fight that really never existed. Except on Cowan’s canvas, that is. With the coming peak of the rut here in the Lone Star State, I thought about all of this the other day, sad in the knowledge that for the first fall ever, all three of those men are gone. First Cowan a decade ago, then Sasser earlier this year, and now Carter only days ago. So too is the late Bob Ramsey, maybe the man who did the most to pioneer the time-honored rattling technique in Texas and beyond. Hailing from Hunt, Texas – yep, that’s the actual name of the town – Ramsey was one of the first deer hunters who believed that time spent chasing whitetails was time to…well, time to make plenty of noise. At least as far as a pair of rattling antlers were concerned. Ramsey, who died in 2009 at the age of 91, managed his family’s whitetail rich 5,000-acre Hill Country ranch for nearly 50 years and is considered by many to be the grandfather of the antler rattling tactic. That's thanks to a technique he described in a small masterpiece written on the subject in 1946 not long after his post-World War II discharge from the U.S. Air Force. That booklet, entitled How to Rattle Up a Buck, was originally published by Texas game call making legend, Johnny Stewart, in 1952. Much if not all of that material was later repeated in Ramsey's book, More Texas Tales, printed in 2002. The late Bob Ramsey helped give birth to the antler rattling technique that is now widely used across the country. Those small volumes explained to curious hunters all across the country the concept of clashing deer antlers together to simulate a pair of bucks fighting over courtship rights to an estrous doe. While Ramsey credited Native Americans and cowboys from the border region of Texas and Mexico with first trying out the antler rattling technique as far back as the 1800s, he first tried the technique himself in 1932. And that rattling session for Ramsey came after a lesson from a neighboring Uvalde County, Texas rancher named Sam Barkley. After Barkley showed the youthful Ramsey how to clash a pair of antlers together, the youngster crossed a natural dam onto the western flanks of the Nueces River into a pecan tree filled bottom to try out antler rattling first hand. He wouldn’t have to wonder long about the technique’s effectiveness. “I started rattling and heard some clattering,” Ramsey recalled during an interview I conducted with him back in 2005. That buck was the first of many for Ramsey and for others that he taught the art of antler rattling to via personal instruction and through deer hunting seminars. One such pupil that credited Ramsey for teaching him the antler rattling technique was none other than the late American novelist, James A. Michener. “In [the novel] Texas by James Michener, you will see on the first printed page under the acknowledgments on the middle of the page where I taught him how to rattle up a buck and how to knap an arrow cave-man style,” Ramsey told me proudly. As it turned out, so did Ramsey. After killing that first rattled-up eight-point buck with a 20-inch spread nearly a century ago, Ramsey kept detailed records, eventually adding up (at the time of our interview, at least) to rattling in a mind boggling 2,006 whitetails for himself and other hunters all across Texas and other parts of North America. For what it’s worth, the phrase “rattling in” by Ramsey’s definition was a buck that ventured close enough for the deer’s antler points to be counted. While the former Texas Game & Fish Commission and Y.O. Ranch wildlife biologist admitted that he had used everything from rattling bags, synthetic antlers, a hunting knife knocked against his rifle stock, and even a pair of cedar sticks beaten together, Ramsey always preferred to use real headbones for a rattling session. 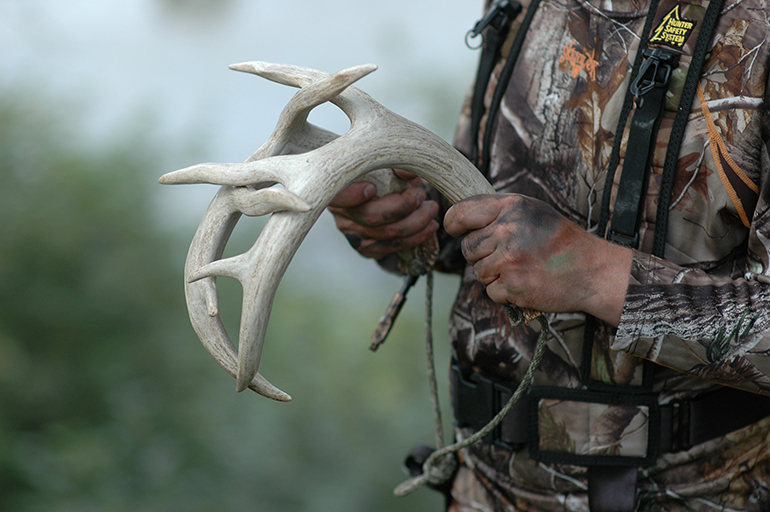 If possible, he would recommend that hunters use a solid set of natural antlers or recent sheds from a 10-point buck. The late Bob Ramsey preferred using real antlers – or sheds – from a 10-point buck for all of his rattling chores. In addition to drilling a hole through the base of each antler through which to tie an 18-inch piece of cord, Ramsey protected his hands by removing the brow tines, sanding down any rough burr points, and “dubbing off” the antler tips. Then it was time to make some whitetail music. After doing a rattling sequence that would last from a minute to a minute and a half in length, Ramsey would then wait several minutes before beginning another rattling session. When it was finally time to rattle again, Ramsey would throw a slight change-up into his previous routine. “The second time, I don’t rattle as loud,” he said. “I figure the deer is coming and all I want to do is let him know the fight is still on. If I’m too loud and he’s too close, he might locate [me]. Since nearly every buck that responds to the technique will try and circle downwind to check for the sound’s point of origin, Ramsey urged hunters to make sure that they set up with a long, unobstructed view downwind of their rattling position. Other tine tickling guidelines from Ramsey included: using the shade of a tree or brush to help break up a hunters outline; using a grunt call and deer decoys to help convince an approaching buck that he’s heard a real antler fight; keying in on the first and last hour of daylight; and rattling on clear, frosty dawns or cloudy, drizzly mornings with an overall wind speed of less than 12 mph. 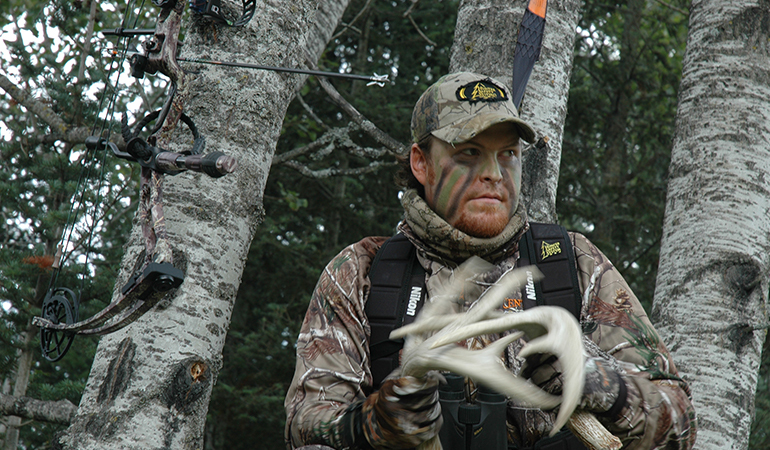 While he thought that the technique worked better in the days leading up to the peak of the rut, Ramsey rattled up bucks during the post rut phase as well. That was particularly true when young fawn does come into estrous for the first time, even after the main autumn breeding circus finally began to wind down. While Ramsey may have helped to birth the antler rattling technique in Texas, the practice certainly isn’t limited to the Lone Star State anymore. 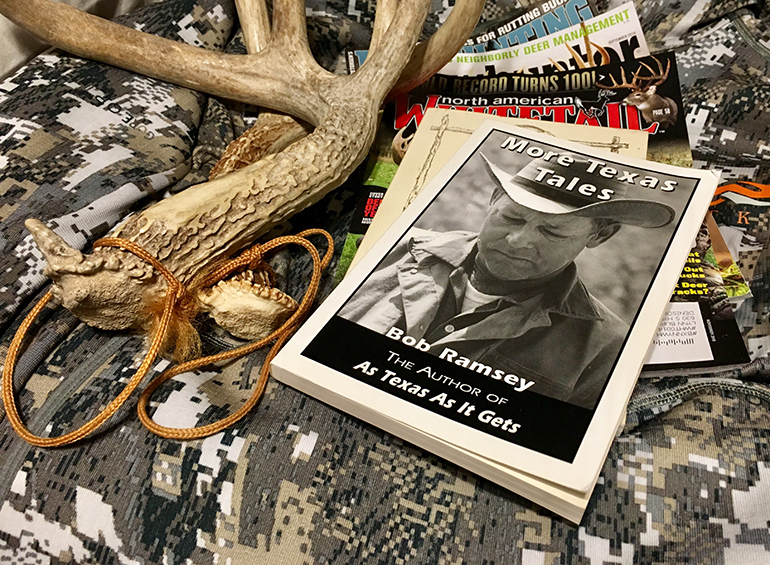 In fact, one fireman in Kansas City, Mo., once told Ramsey that the Texas hunter’s instruction had helped him bag trophy bucks nine years in a row. Fortunately, from deer hunting firemen to outdoor television show talent on the Outdoor Channel and Sportsman Channel to Pulitzer Prize winning novelists, the late rattle master from Hunt, Texas was more than willing to come clean on his secrets of rattling up a big whitetail. So with the November wind blowing steadily from the north outside my North Texas home, if you'll excuse me, I'm going to go and find my rattling horns. Because with any luck between now and Thanksgiving, I'll have another reason to look skyward and thank the late Ramsey for sharing the rattling technique with the world. A classic hunting technique that hopefully will lead another buck on my hunting ground to make the mistake of coming to horns.